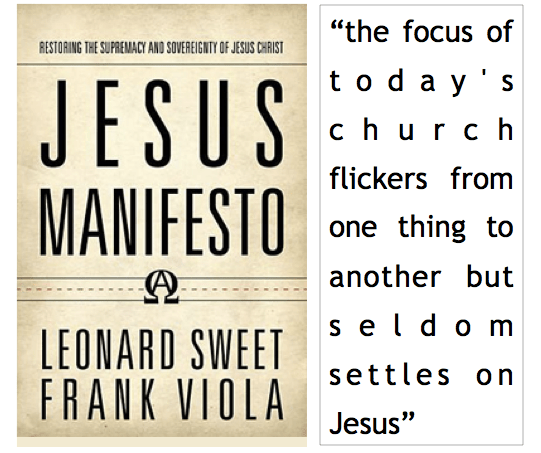 I am currently re-reading the book ‘Jesus Manifesto‘ by Len Sweet and Frank Viola subtitled ‘Restoring the Supremacy and Sovereignty of Jesus Christ’. In this book Len coins the phrase ‘Jesus Deficit Disorder’ (JDD), a play on the familiar mental condition labelled Attention Deficit Disorder (ADD). His contention is that the focus of today’s church flickers from one thing to another but seldom settles on Jesus. Like a child with ADD the body of Christ focuses first on social upliftment, then on politics, then on getting rich, then on biblical knowledge acquisition, and so on … but seldom on Jesus. Yet Jesus Christ is the creator, sustainer, head, and lord of the church. Without Him the church just isn’t the church. It may be a religious institution, or a philanthropic society, or a bless-me club; but without Jesus at its very centre it cannot be the church. I conducted a little rough and ready ‘research’ of my own. I looked at the list of the top ten articles for pastors published on SermonCentral.com over the past five years. I reasoned that what pastors valued most as input must reflect in some way on what they believed was most important to them. The first article listed was ’21 irrefutable laws of communication’, the second was ‘5 things God never said’ and the third was ’20 non-preaching websites for better preaching’. The list continued with not a single mention of Jesus or anything to do with Him. I read the list to my wife and she responded, with a gentle smile, that pastors like me were focused on leadership and preaching related matters and that the list didn’t represent the real focus areas of Christians in general. So, I Googled ‘bestselling Christian books in 2010‘ and found that the name of Jesus features in only one book title, and that was 365 day devotional! After reading through the list I can understand why Sweet and Viola write of ‘ best-seller Christianity, which has become self-centeredness wrapped up as “spirituality”’. So, from the evidence of my rough-and-ready research it looks like the church may well be suffering from JDD. But what can the body of Christ take to treat this malady? 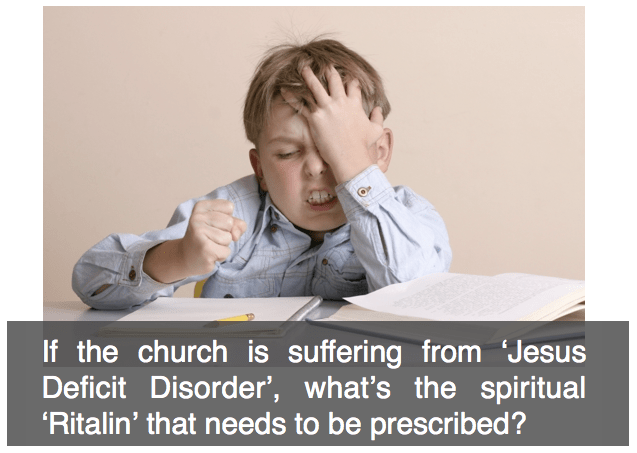 Perhaps the Bible is the Ritalin the church needs for recovery. No I don’t think it is. In general, the church still honours the Bible and often makes it the focus of attention. However, it is all too easy to read the scriptures without seeing that they consistently point to Jesus. The Pharisees of New Testament times had this problem because Jesus had to say to them, “You diligently study the Scriptures because you think that by them you possess eternal life. These are the Scriptures that testify about me, yet you refuse to come to me to have life” (John 5:39-40). Not much has changed since then. Sweet and Viola write; ‘The written Word is a map that leads us to the living Word. Or as Jesus Himself put it, “The Scriptures point to Me! ”Every part of the sacred text breathes the same oxygen—Christ. So the Bible is not the destination; it’s a compass that points to Jesus— heaven’s Lodestar’. Thx. for this excellent blog post. I’m honored and encouraged. “Epic Jesus” and “Beyond Evangelical” and a forthcoming book out in the Fall (by Sweet and I) pick up where JM leaves off.